Google is experimenting with a new update notification for Chrome users on Android, as the company wants devices to always be running the latest version of the browser. As spotted by ChromeStory, the Canary version of Google Chrome for Android now shows an update icon right in the browser window, thus letting users know a newer release is available for download. When opening the settings menu, Google Chrome now shows a message that reads “Update Chrome. Newer version is available” in a red font. 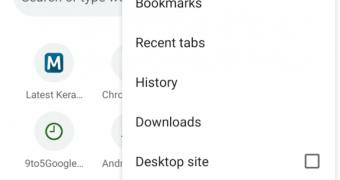 Tapping this option points users to the Google Play Store where they can download the latest version of the browser, and the notification then goes away. Samsung Promises Monthly Security Updates for Unlocked Smartphones in the U.S.